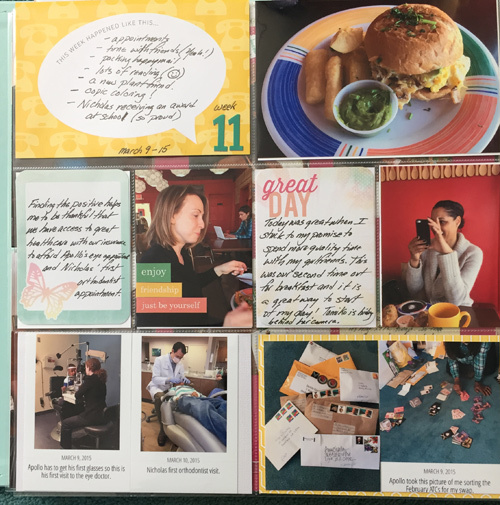 This week was filled with a lot of everyday happenings and I even had to add an insert to preserve some important memories. I was feeling blue about something and I stopped in for my weekly shopping at Trader Joes and I saw this little beauty in the flower section. She is my new orchid called Little lady. As if the beautiful flowers aren’t enough they had to name it that. Little Lady orchids are a true miniature of the typical Phalaenopsis orchid plant. They grow to no more than 7.87 inches high. Which is about a third of a regular orchid. Another bonus is that this Little Lady will bloom up to 12 weeks. I fell for orchids many years ago when I went with my mother to an Orchid show on Cape Cod. We both bought a few plants and so began my love affair. I add new ones to my collection when the feeling is right. On this day, the feeling was right. I have her in the pot she came in but will transfer her to something prettier soon. She is so small I have her on my desk so I can see her everyday while I work. I was a little down because Apollo had found out that he failed his eye exam and he would need glasses. I knew the chances of him getting glasses was inevitable but was hoping not so soon. But the picture above shows him the day we walked out of the eye doctor’s office with his first pair of glasses on. He was so happy and that eased my concerns for him. 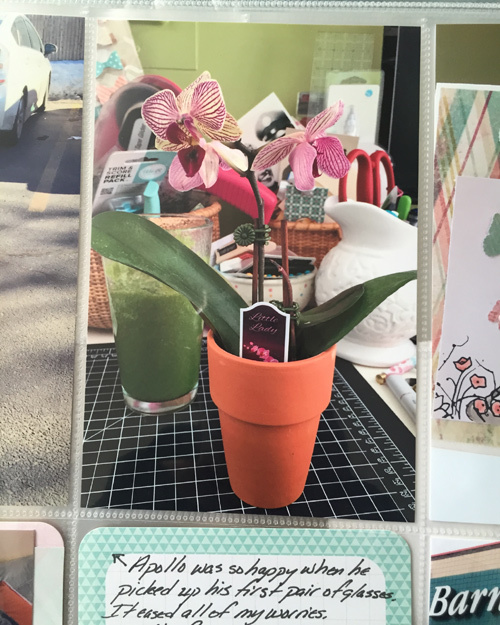 I included a picture of the latest card I colored up and me reading at pick up. The last picture is so great seeing Apollo siting in a Hero Yoga seated pose. Of course he is just sitting playing and I walked by and told Leao to look and explained the flexibility required to sit that way and he just did it unknowing. Love it. 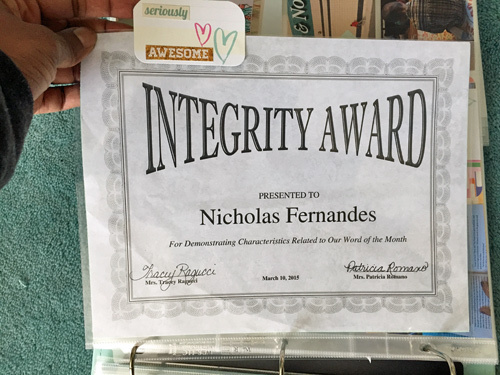 I added an 8×11 insert to hold Nicholas’ recent award from school for Integrity. I am so proud. 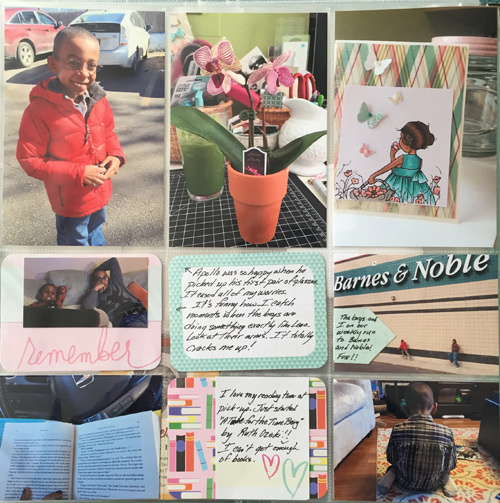 These awards hold a special place in my heart even more so than the report cards. I love that he received this award. I am one proud momma. Breakfast with two of my favorite friends always makes my day. My food was so yummy and filled me through lunch! A week of doctor’s appointments (dentist and orthadontist) filled the beginning of the week. Apollo took a picture of me sorting for mailing out the ATC happy mail. Busy week. I like the vibrant colors of our breakfast place so I played off of that for my color selections. See you next Monday with week 12.